We planned this pedal, with a vintage fuzz circuit, specifically for the bass guitar. However, guitar players have also achieved exceptional tones with the pedal. At its heart are 2 very rare NOS (New Old Stock) Russian germanium transistor. These give the special, organic, vintage sound. We paid special attention to ensure that all components of the fuzz circuit are original and authentic from the 1960’s. During development we listened to vintage recordings and current bass lines so as to produce a pedal that is equally good for players of all genres. 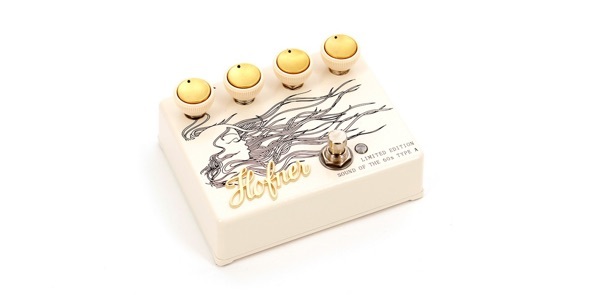 The pedal compliments a Höfner bass giving sounds like the fuzzy bass of “Think for Yourself”, while with a modern bass guitar it sounds like a stoner bass of the 1990’s. A creamy low level of fuzz can be increased to a cutting full on roar from your bass allowing you to punch through the rest of the band if necessary. The Volume pot change the output signal. With the Bass pot you can filter the low frequencies. The Fuzz pot affects the amount of distortion. We recommend this pedal for all bass players who want to experiment with fuzz bass sound whether that be low level distortion or aggressive cutting total fuzz. 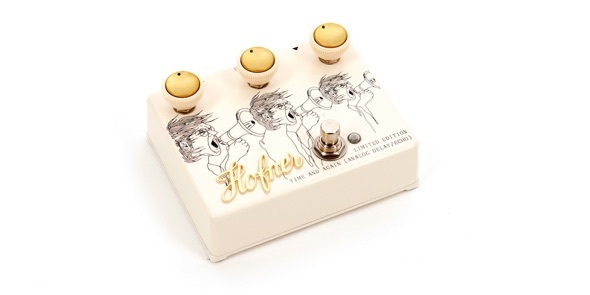 Each pedal is finished with a genuine 1960s raised Höfner logo. Each pedal is individually handmade to bring you a truly authentic sound. The “Time and Again” pedal was designed to deliver genuine analogue delay, giving superior sound to your performance. The three controls let you easily create the perfect delay without compromise to your overall tone. This is genuine controllable delay, not a series of wobbly echoes, with a totally smooth tone. The Time And Again is a classic, vintage, warm sounding analog delay pedal. This pedal is able to produce delay times ranging from 30 to 300 Milliseconds. It’s got three dials with adjustments for Echo, Feedback and Blend. The Time And Again has a very rich, full sound, thanks to its all-analog circuit that uses a “bucket-brigade device” (BBD) to create the delay effect. Capable of a wide range of tones from doubling to quick slapback to long repeating echoes, the character of the BBD effect is distinctly different from digital delay, which tends to be very crisp and defined. The heart of this circuit is the famous and very rare MN3005 BBD chip. So this circuit is 100% analog. The Echo pot changes the time of the delay. With the Feedback pot you can change the repeats from one to endless, oscillating delay and with the Blend knob you can add the delay effect to the clean signal path. 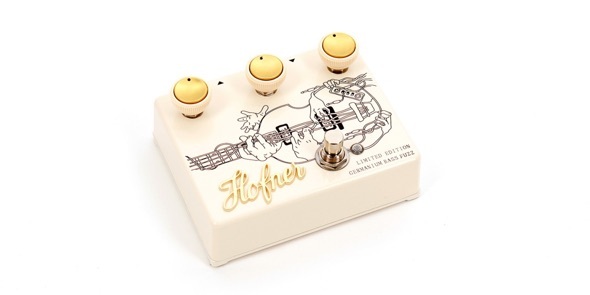 Each pedal is finished with a genuine 1960s raised Höfner logo for an extra touch of luxury! Individually handmade in Europe this Treble Boost pedal has been carefully tested and built to bring you that authentic sound from the 60s and 70s. The three controls – Range, Shine, Body – give you a great range of sound and excellent control over your sound. Treble Boost pedals feature on many of the classic recordings from the 60s and 70s, heard on numerous lead guitar and even rhythm guitar. This pedal accurately captures that great vintage sound, letting your guitar cut to the front of the band when needed. The circuitry on this pedal has been painstakingly tested again and again to achive the perfect treble boost sound, strong, bright and cutting without sounding rough or torn. This pedal is a replica of the legendary Dallas Rangemaster treble booster unit. A type of BOOSTER, not really a distortion pedal nor a clean boost - it does modify your sound quite a bit. It excites certain frequencies and pushes your amp to allow it to create rich tube distortion. The pedal colours your tone, with a crunchy overdrive, boosting certain frequencies and warming the tone with the ultra rare NOS (New Old Stock) Mullard OC42 germanium transistor, like in the original pedal. It has a raw, open sound. We complemented the original circuit with some useful functions. The Range pot functions like a gain pot. The Shine pot is a high frequency cut filter and with the Body pot you can change the type of the frequency boost (it is a simple a low frequency cut pot). Into the pedal we have built a special polarity change electronic circuit, so that you can set it in daisy chain with your another pedals. 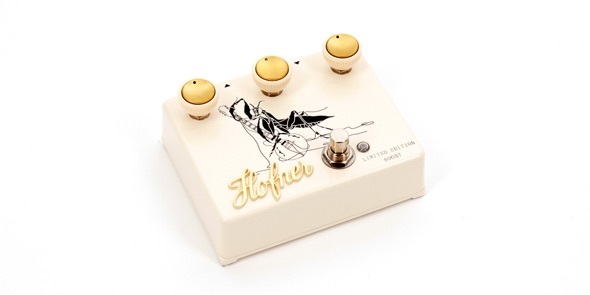 Beautifully engineered in an all metal case, with the famous Höfner "teacup" control knobs, each pedal is finished with a genuine 1960s raised Höfner logo.